In light of the intense heat, busy days, and oven repair that's been going on here, I come to you today with a quick, cold, no-cook/bake, super-simple frozen dessert. This mango-coconut sorbet takes just 3 ingredients and about 2 minutes to make from start to finish. This reminds me of banana "ice cream" because it really is as simple as tossing a few ingredients into a blender and letting it whirl. I saw the recipe - if we can even call it that because it's so simple - on Ellie's Real Good Food on PBS this past weekend and thought I'd give it a try. For 2 servings, start with about a cup and a half (8 oz.) of frozen mango chunks. Add 1/4 cup of light coconut milk and 2 tablespoons of honey. Then, blend until smooth. Add a bit more coconut milk, as needed, and taste to see if the sorbet is sweet enough for you. That's it! Straight out of the blender, the sorbet is soft as shown directly above. It's totally ready (and very good) to eat immediately. If you prefer to firm it up a bit (as shown in the other photos), place the sorbet into a container, freeze it for 20-30 minutes, and then scoop and enjoy. 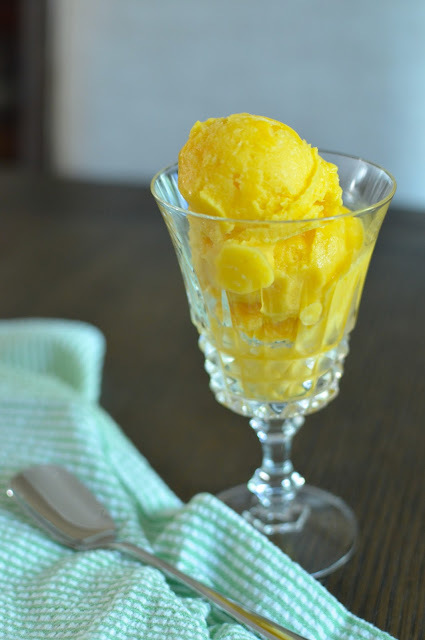 This mango sorbet, with a hint of coconut flavor, is light and refreshing. I love how it's not cloyingly sweet like many mango sorbets on the market. And since it takes only 3 ingredients and about 2 minutes, it's certainly worth making right now! I can hardly believe that I didn't always have a blender. I have a very basic one that requires me to stop it and scrap things down the old-fashion way but it does the job! You literally have mango-coconut sorbet in minutes, and it's really good straight out of the blender. If you freeze it for a long period of time, let the sorbet sit out on the counter for about 15 minutes, or long enough for it to soften. We think it tastes best a bit soft - you really taste the mango-coconut flavor. I'm not complaining but boy, it's been hot! This mango-coconut sorbet really hit the spot, and it was a perfect interlude for me as I took a day off from baking the other day. My oven had been on the fritz and as it turns out, it needed a new ignitor. Clearly, I use the oven way more than average because this is not my first experience with needing a new ignitor. It really has been too hot to turn the oven on but, somehow, I've been doing it anyway. Maybe it's a good thing we're off to have some family fun and relaxation soon where cooking/baking won't be on the itinerary. I hope you've been enjoying the summer, taking breaks, and squeezing as many good times out of it as possible! Place ingredients in the blender and blend. Stop the blender and scrape down the sides with a rubber spatula as needed. If necessary, add more coconut milk and blend until mixture is smooth. Taste, and adjust sweetness if necessary. Serve immediately or if you prefer a firmer texture, freeze for 20-30 minutes before scooping and serving. You can store the sorbet in the freezer for about a week; allow it to sit out on the counter for about 15 minutes, or until sorbet softens, before scooping. Wow Monica!!! this looks amazing. Love the color, cannot believe it's only 3 ingredients and a few minutes blender time. Will be making my own for sure. I couldn't quite believe it either. It's so easy using the frozen mango chunks, which I get at Trader Joe's. Hope you try it for an easy treat one day. I think it would be very hard to wait! I love this simple recipe with the gorgeous color. I bet it is super refreshing. I love a good cold blender dessert :) Thanks for sharing this gem! Love how simple the recipe is and how gorgeous it looks. Thank you so much for sharing this! A healthy and yum ice treat! Lovely, Monica! Right now i can't decide if i like this last bit of heat, or if i want fall to start. I have no choice, actually : our heat is solidly here for the time being, so this would be a perfect way to cool down and enjoy it. Perfect flavors here! I'm definitely trying to slow down time so I'll deal with the heat. : ) Thanks for swinging by...enjoy the rest of the summer. I love the sound of this sorbet! I didn't have a blender for so many years and now I have no idea what I'd do without it! I use mine a minimum of once a day! Happy almost Friday Monica! Love how quick and easy this is! Oh, and that color! 3 ingredient sorbet is perfect way to beat this heat! I love the mango coconut flavor combination! Yes, it has been the summer for non-stop frozen things! I can't complain! I can't resist such basic "recipes", Anu. Oh no, hope your oven is fixed soon, Monica! 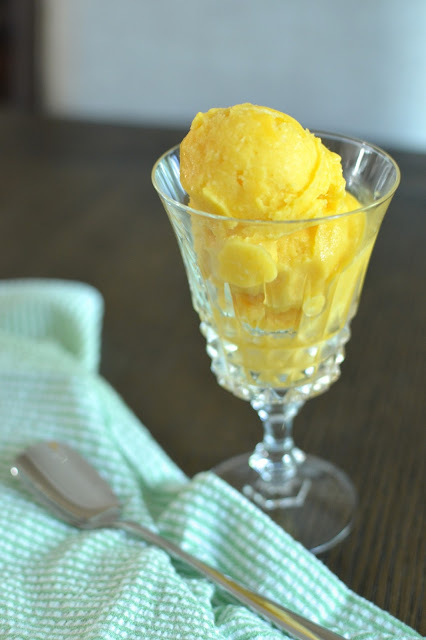 Love everything about this 3-ingredient mango sorbet! It's been so hot here and a big bowl of this sounds perfect to cool down with! The new ignitor is making the oven super hot and roaring again, Kelly! Thanks! So glad to hear it. Hope you've had a good summer! This is just amazing! Mango reminds me of summer and the colour takes it a step further. I'm dying to try this out! This sounds terrific - I absolutely love mango, and I can't believe how easy this recipe is! This one's a keeper. Hope you try it, Beth. I love how easy this recipe is and made with so few ingredients. Perfect for summer. What a fabulous recipe! We don't think we could wait - we would probably eat this mango coconut sorbet right from the blender. Love how easy it is too! It happens to be good/best right out of the blender anyway! This sounds perfect for these dog days of summer! Turning on the oven seems cruel at this point--I love how fast and easy this is! My husband isn't a big fan of icy things like sorbet either but he liked this...the coconut milk adds a nice richness/creaminess. Hope all is well! Weird enough it has been a bit cool in LA this couple weeks. It almost feel like Fall. Totally bizarre! But when it comes to ice cream/sobert, I can eat it in any season. :D This sorbet sure looks easy and quick! Going to try it soon! I have to say I'm looking forward to the cooler Fall weather (not winter so much)...Hope you whip this up if it gets hot! This looks delicious and perfect right about now! I love mango ice cream and would also love mango sorbet. Enjoy the rest of the hot summer! Glad to hear it, Adina. Thanks! Really good to have another recipe similar to all the banana ice cream recipes you see around! We are a huge fan of sorbets and mangoes are just so irresistible! I hear you...I love a sweet, fruity, icy treat here and there.